It's normal to think that horrible case of food poisoning you had two years ago might affect your FAA medical examination. But don't worry – here are a few tips about what to expect and how to pass your physical with "flying colors". by Richard A. Hansen, M.D. Every week, people come to our clinic for their annual or biannual flight physical. Some are students, just learning to fly. Others are experienced pilots, who have hundreds of hours of cockpit experience, and who have been through the examination many times. There is always some apprehension, though, because of the implications of pilot privileges. We always reassure the applicant that this test is mandated by the FAA, not to keep people from flying but to help them fly safely. There are four areas that receive special scrutiny, in which a little coaching and preparation can make for a better outcome. These are the ones you can prepare for, and breeze through without a stall. Read the entire article here. Before you take your first solo flight (before you get your pilot license), the FAA requires that student pilots undergo a medical exam and have a medical certificate issued by an aviation medical examiner (AME). At About Time Aviation, we recommend our students visit Dr. Richard Hansen at Emerald Valley Wellness Center, located in Creswell. 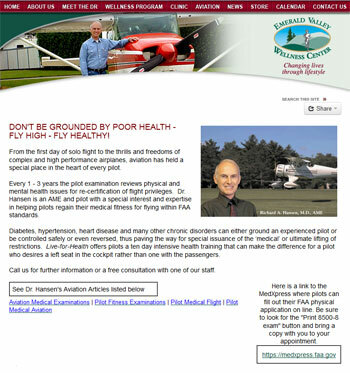 Dr. Hansen is an AME and pilot with a special interest and expertise in helping pilots regain their medical fitness for flying within FAA standards. Private pilots require a 3rd class (or better) medical certificate. The medical exam consists of a basic check of your general health, vision and hearing, and generally costs about $100. Private pilots must have an exam every five (5) years if you're under 40 years old, then every two (2) years thereafter. Commercial pilots and Airline Transport pilots require 2nd and 3rd class medical certificates respectively. The medical exams associated with these certificates are more extensive and generally more expensive. Talk to your instructor and Dr. Hansen for more details. Please visit Dr. Hansen's website for a wealth of articles and information about your health and how to stay safe in the air.